Norman Wilkinson, 1878-1971, marine painter. Norman's greatest love was painting, his subjects were seascape and landscape in both oil and watercolour. His early career as an illustrator for the Illustrated London News enabled him to develop his talents as both artist and entrepreneur. Norman made a notable contribution to WW1 with the invention and development of Dazzle Painting, a form of ship camouflage. 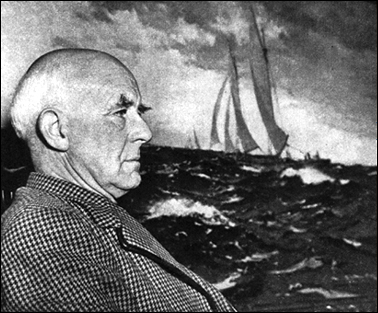 During WW2 he painted a record of the major sea battles and presented the series of 54 paintings to the Nation. They are kept at the National Maritime Museum. Norman's commercial work included the production of many illustrated books and he initiated a revival in poster painting for LMS Railways. His works are held in both public and private collections.